Hotel loyalty programs such as Marriott Rewards and IHG Rewards Club are a fantastic way of leveraging hotel stays and everyday spend for free nights, upgrades, free meals, and rockstar treatment. But hotel chains aren’t the only providers to offer bonus nights and elite status. Hotels.com Rewards (formerly Welcome Rewards) is the loyalty program for online travel agency Hotels.com. It’s free to sign up, and you'll earn one free night for every ten nights booked through Hotels.com (11th night free), plus the opportunity to achieve Silver & Gold membership tiers which provide access to exclusive offers and priority customer service. How Does Hotels.com Rewards Work? 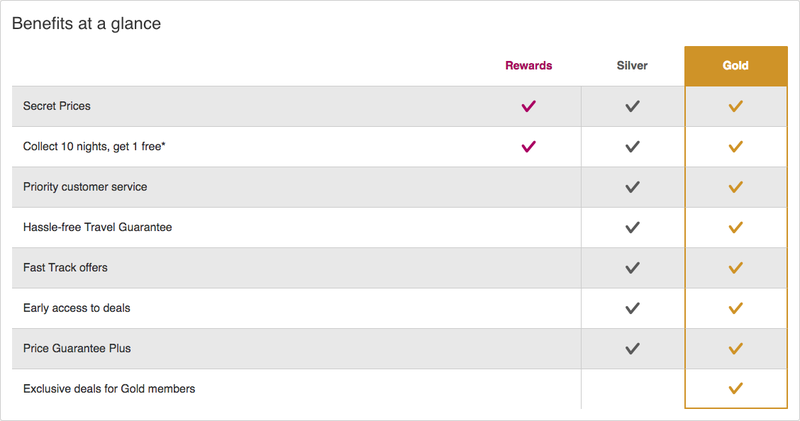 As far as rewards programs go, they don't get more straightforward. For every ten nights booked through Hotels.com, you receive one free night. The value of the free night is calculated on the average price of the ten nights you collect. As a base rate of return, you’re earning 10% back on hotel spend booked through the Hotels.com booking engine. You can add 3-5% cash back into the equation by going through a portal like befrugal.com, in addition to regular promos offering double free night credits for each stay. Potentially 20%+ return on your hotel spend. Click through the befrugal.com cashback portal for 3% cash back (or 9% back if you don't take the Hotels.com rewards). Barclaycard Arrival Plus® World Elite Mastercard® (See Terms) and redeem the charge as a statement credit. Chase Sapphire Reserve® earning 3X Ultimate Rewards points, and receive $300 back as a travel credit (3x points on travel kicks in after the initial $300 is credited). Capital One® Venture® Rewards Credit Card or Capital One® VentureOne® Rewards Credit Card and earn 10x Venture Miles per dollar on all hotels.com spend. Venture miles now transfer to 14 different airline partners. As a Rewards member, each night will count towards Hotels.com’s ‘Collect 10 nights, get 1 free’ providing a further 10% off on the back end of the transaction. If you utilize either of Capital One's Venture cards for 10x points, stacked with the 10% back on Hotels.com spending, you'll get 20%+ back on every dollar you spend. A top return by anyone's standards. You can also shoot for Silver and Gold elite status within the program, but the benefits are negligible, not what we’re used to seeing from the likes of Hyatt or Starwood. The most valuable benefit you'll likely receive is access to agents that may be able to help waive cancellation fees or get properties to provide a one-off exception as requested. It’s important to note that taxes and fees are not included in the free night calculations. The average is worked out off the total cost of the nights minus the fees and taxes. Why Choose Hotels.com Rewards over a Traditional Hotel Rewards Program? The first reason is fairly obvious; Choice. Hotels.com has over 290,000 properties on the books, spread across 200+ countries. A much bigger selection than any single hotel family could hope to achieve. A stay in any property booked through the Hotels.com booking engine counts towards your free night. In destinations like Greece's Santorini or New Zealand, where chain hotels don’t have the coverage they enjoy here in the U.S., you can still achieve a top return on your hotel spend, even when staying outside traditional brands and loyalty programs. Secondary to choice would be value and simplicity. With a base ROI of 10% (more through cash back portals and regular promos), Hotels.com will outperform the majority of hotel loyalty programs if you are not a top-tier elite. 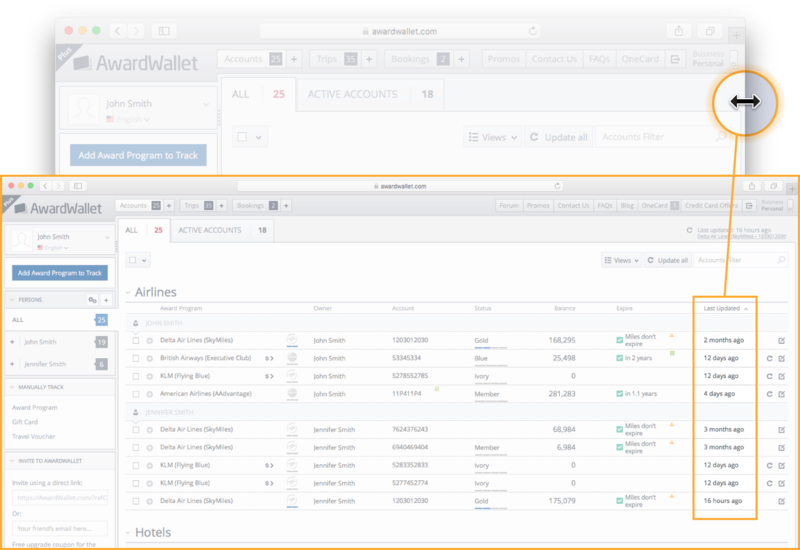 It’s a basic program without the traditional pitfalls or location restrictions of chain-specific loyalty programs; you can book hotels in any destination and redeem your free night in any eligible property (over 213,000 at time of writing). It’s also fairly easy to pick up Hotels.com gift cards on sale for up to 20% off retail prices. If you combine the gift cards with the ‘Collect 10 nights, get 1 free’ on the Hotels.com Rewards program, you can potentially achieve savings/returns on your hotel spend of over 30%. Redeeming your free-night certificate is simple. Free nights are credited to your account after completing the 10 required nights. The value of the free-night certificate is directly correlated to the spend for your 10 qualifying nights, minus fees and taxes. If you spent $1,200, you'd receive a $120 credit in your account. You can redeem the credit for a more expensive room and pay the difference in cash. However, if you apply it to a room that costs less than the value of your free-night certificate, you will not be credited with the difference. There are no blackout dates, and you’re not restricted to ‘standard’ rooms, you can apply the credit to any room as long as it is at a property that participates in the rewards program. You can redeem multiple free nights on the same reservation, just paying the fees and taxes associated with the stay. Free nights are refundable, provided you cancel within the hotel's cancellation window. 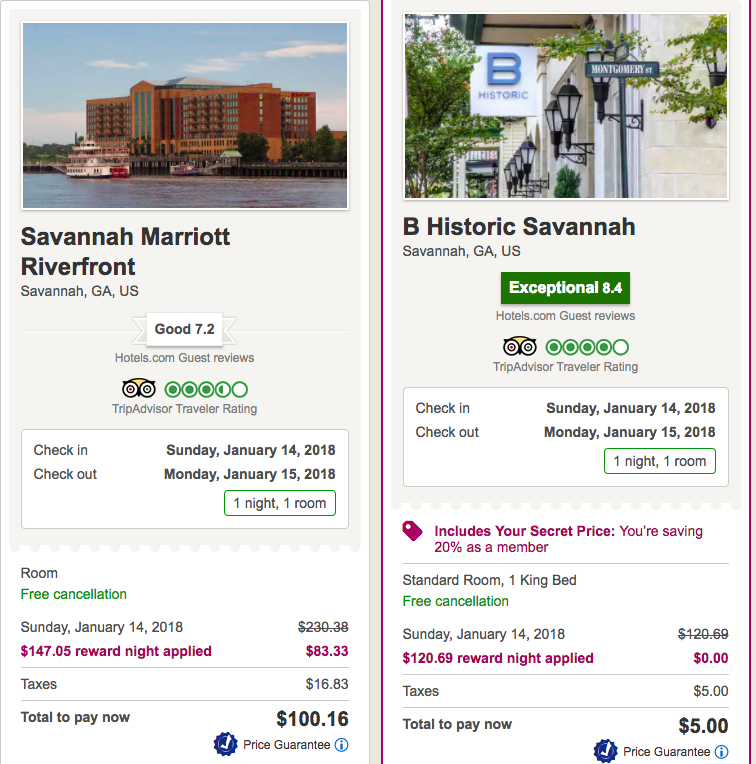 The example above shows a reward night worth $147.05 and how it is applied to a reservation priced at greater than the value of the reward and a reservation priced under that amount. In both cases, you see taxes are still charged. The elite status tiers offered by Hotels.com are nothing to write home about. The only tangible benefits are early access to exclusive deals and a higher standard of customer service if you wish to make changes to a reservation. To achieve Silver status requires 10 nights, the same needed to earn a free night, and attaining Gold requires 30 nights booked and stayed. Unfortunately, using the discount coupons regularly provided on Hotels.com's website or via emails will negate the free night credit for that stay. You also won’t typically receive cash back from portals if you apply discount coupons or pay using gift cards. For many, the biggest drawback will be that stays booked through Hotels.com won't be eligible to earn points or elite-night credits when staying with a major hotel chain that does have its own loyalty program. If you have elite status, you also won't receive elite benefits like free breakfast or late check out for these stays. This is the case with any third-party booking, but it's especially relevant when considering the tradeoffs of booking a stay through Hotels.com. Hotels.com Rewards free nights and free night credits expire after 12 months of account inactivity. Booking stays and free night redemptions are considered qualifying activity; however, you won’t earn free night credits when redeeming for a free night. You need to run the numbers when booking with major hotel brands: Depending on your elite status, cash-back rates through portals, and other factors such as members discounts, you may get a better return sticking with the hotel's own rewards program, leveraging co-brand credit cards like the IHG® Rewards Club Premier Credit Card, and chasing down quarterly promos like IHG's Reward Nights Faster, Marriott’s Free Nights promo, and Hilton's Points Unlimited. Hotels.com Rewards is an easy-to-understand rewards program offering a base 10% return on hotel spend, with the potential for much better returns if you can take advantage of promos and discounted gift cards. You won’t receive elite benefits or loyalty points from major hotel brands for your stay, but you will have the freedom to book and redeem rooms for any destination, outside of the traditional award-travel footprint. Plus, a little social engineering at a hotel still might score you an upgrade. Hotels.com is a great alternative when you are booking outside of your primary hotel brands, particularly in destinations where independent and boutique providers have better coverage. If you’ve earned and redeemed a free-night credit from Hotels.com, we’d love to hear about your experience in the comments below. If I book multiple rooms for a group would I get credit for all rooms and all nights or do they limit it? You would get credit for all rooms/nights. I do this all the time. I don’t see it being a problem. Hotels.com is always nice place to book hotel, its nice to get status or redeem stuff there. I have been hotels.com gold status for a few years. I’m not loyal to any particular brand so it works great for me. I don’t see any possible way for me to get the same actual cash value out of any one brand, and the other benefits are not worth much to me. I will usually buy gift cards from 15% to 23% off and combine them on the hotels.com website up to $2,000 each. You can only pay with one gift card and the balance will have to be paid with a credit/debit card. While you may pay some taxes when redeeming free nights, it’s certainly not the full amount. I will actually redeem my free night rewards in areas with higher taxes/fees like NYC to increase the value of the reward. For example, I booked a room for $169 with taxes around an additional $30. I booked that same room using a $167 “free” night reward and my remaining balance was around $5. I always check cashbackmonitor,com for the current best cash back rate and have never had problems collecting cash back when paying with gift cards. Rates are usually 5% or more. Their best price guarantee is usually easy to take advantage of. Even on prepaid nonrefundable rates, they will refund the difference if the price is lower on their site or any other site-up to the day before your stay I think it is. They will not, however, honor member only rates from hotel chains or anywhere else. As far as “Gold” benefits. I have occasionally received nice room upgrades but I can’t say for sure that my gold status had anything to do with it. At some hotels/resorts I have received 15% off spa services. Customer service is definitely better. I have had some issues I had to call about and they have always resolved the issue to my satisfaction. Only one time did it take more than one call. I have had them cancel and refund “nonrefundable” bookings and they have issued $150 account credits to make sure I was happy on two occasions. in total, I almost always get at least 26.9% cash back plus the 10% hotels.com rewards. I know you can argue the true cash value of the hotels.com rewards since we never pay full price with cash. The way I see it, I can book a hotel room just about anywhere I need to for about one third off. Thanks for the detailed comment, this is a great example of how to leverage hotels.com for big discounts. I think for someone who doesn’t travel a routine route, or that regularly, you have a great strategy. I won’t say you can’t beat it though. Some people travel for work, and the perks that come with a Diamond-level status at some of the brands might ultimately make more financial sense in the long run, while being able to bank those points for personal use down the road. A lot of variables, but you have a good strategy too. Dude, u r the KING! I gotta try this! Yes, this is the sort of post that has enough details that you will be convincing others to follow suit. Thanks for taking the time to share the persuasive info! Many thanks Mark. I often stack with cashback sites and rewards credit cards, but I was not aware you still got the 10% rewards when using gift cards. I’m going to give it a try. Always good to have another option and to use it if the bottom line works out to be better. Thanks for the clear explanation and example. With my Hilton Gold status I prefer the free breakfast for my wife and me. This is a very overlooked by many people. They will pick a hotel on Hotel.com that is $10 cheaper but will spend $30 on breakfast. Definitely, but there isn’t always a Hilton available. I merely love Hotels.com. Each year I have 3-5 nights in non-chains hotels, sometimes more. I’m booking them at Hotels.com through Topcashback.com and enjoying both cashback and 10% credit for future stay. Is this better than booking with elite status at hotel chains or is Hotel.com mainly only good at indie hotels? Depends on your stay patterns. My wife maintains elite status with 2-3 different hotel programs as she travels a lot for work, but we still use hotels.com for 20-30% of our stays as the deals and locations are better than what the we can get with the big chains. I’m a big fan of being a free agent so this works for us. If you primarily stay in major cities and hubs, sticking to one program might provide better value. The only way this program is worth while is if you dont spend enough nights in a hotel to gain elite status. Between Hotels.com and rocketmiles, i’m not sure which one would be a better option. I guess it depends on what you are trying to earn. I can see why it would be good for options and at least you’ll get a free night after 10nights. I have a hard time wanting to book through Hotels.com because I do want my hotel perks with Hilton, etc. I can see why for non brand hotels, b and bs, etc. I wonder how they handle issues. There are some sites offering 15% discounts. Better a 15% discount immediatly instead of eaiting 10 nights. Partner prefers peace of mind knowing reservation is thru the specific hotel chain for the perks and against the fear of something going wrong due to middle man so this is not for us. -Hotels.com gift card in USD can be bought for as much as 20% off online. -Many local sites, even those first set up by the parent company expedia, are often spun off, sold to local / regional business, and go belly up. Information on the internet can help you to truly maximize the value of Hotels.com, even if you do not reside in North America. It’s true. I can dig more on the hotel.com when I usually travel in neighbour towns during current Spain living. Hotels.com is one of the few great uses of the Capital One Venture card. There’s definitely a place in the world for Hotels.com. Your pitfalls definitely are some that keep me from using it regularly, but yes, it’s got some benefits too without question. Good breakdown. Thanks for the tips! I’ll definitely consider this. They only expire after 12 months if you have no account activity. Provided you book a qualifying stay or redeem a free night every 12 months, your free night doesn’t expire. I hotel.com Rewards available for users in Europe? Utilizing heavily for a trip to New Zealand. Great choice of B&Bs. Great to hear. I’m a Kiwi born and raised and unless I want to frequent Best Western’s, it’s hotels.com or Airbnb that get 80% of my $$$ when I fly back home. Good point, some places just don’t have many chain hotels. Thanks for the tip about how to stack with BeFrugal. I love using hotels.com,but I prefer the immediate discount I get using the promo codes rather than wait for a free night. How can you compare Hotels.com and Expedia? Which rewards program is better? I am usually booking hotels at their site and have pretty good experience with them. I don’t have enough experience with Expedia to compare them. I’ll add it to our post requests to do a comparison. This is something that I am going to have to consider more seriously as the hotel programs become increasingly more convoluted and with fewer elite benefits. I would definitely want to get a Capital One card if I decide to go this route. Which program is best in general for sporadic night in non-chains hotels? Hotels.com? I’m a fan of hotels.com because you only need to book one night per year to keep your account and free night credits active. Technically, you could book 1 night per year, and ten years down the track you’ll receive a free night. A lot of the places I travel with my wife and kids, there are no chain hotels, but I’m yet to travel to a country that hotels.com doesn’t cover. Even some of the remote locations we’ve traveled in Tibet and Nepal had accommodation listed. From memory, Expedia runs a similar program and I think Citi even offers an Expedia Rewards credit card, but I don’t know enough about it to recommend it or not. Great info about hotel programs, it’s def. a place I am lacking in my portfolio of points. When will the free nights credit expire? Your nights will not expire as long as you keep your account active at least once every 12 months. FYI – You don;t get a reward night if you use coupon. Unfortunately, using the discount coupons regularly provided on Hotels.com’s website or via emails will negate the free night credit for that stay. You also won’t typically receive cash back from portals if you apply discount coupons or pay using gift cards. I know that some portals state that you will not earn cash back if paying with a gift card but I have never seen this be the case. I almost always use a gift card to pay and have not had issues with the full amount tracking on any portal. I like how hotels.com has their own silver/gold elite status! My concern with using hotels.com is that I will get lesser treatment/rooms at the property as compared to booking directly. However, not all people are into the extra length to get the special treatments, so this program work for them best in the most intuitive way. I could see this working for some people that stay at several different chains. I’m switching to Hyatt this year so we will see if that works out as far as perks and status are concerned. I use Hotels.com all the time! Honestly, it seems like this is the best bang for your buck. It does require you to stay 11 days in a hotel, but you could probably take advantage of that at least once a year. I’ve noticed that at least with Vegas hotels, Hotels.com rates are often are no cheaper that booking directly with the property. Oops I didn’t know hotels.com had a rewards program. Thanks for the tips for stacking with Hotels.com. I haven’t used them yet because I usually stay on points directly with the hotel chain. I may need this in the future though! This can be interesting when booking stays with independent and botique properties. When not using a loyalty program I prefer using Orbitz as they always have coupons and you get money back straight away to spend on your next booking. With hotels.com I feel I’m paying for that free night as the using of coupons voids the stay. Always look at hotels.com when comparison shopping. With the portals and coupons, it’s oftem cheaper than the other avenues. I like the rewards direct with the hotel.. but this is a good alternative too! I’m just glad that Hotels.com upped their game to increase the competition. always be sure to give the hotel with your hotel membership ID. although technically you are not supposed to be credited for bookings made through hotels.com and other similar sites, the fact is that about half the times I am credited for the stay. In the end, it’s another option to consider. I’ll look at the various options and pricing, and, I guess my points will continue to be spread around based on the best deal I get, until I redeem them in any specific program. I should be taking better advantage of this program. Thanks for the reminder. Ah…. So many choices! Thanks for all of the ways shown by your blog. I normally buy $100 Hotels.com GCs for $90 on sale. I’ll definitely consider hotels.com rewards in lieu of another hotel rewards program I’ve been a part of. Seems like hotels.com comes with more choices/flexibility, and consistently offers competitive rates. The free night for every 10 nights booked makes this program even more attractive. It’s good to have choice, I rather have some low end status with the hotels so they don’t give the worst rooms. Interesting. Hotels.com’s loyalty program can actually end being fairly lucrative if you’re able to get a good deal on the initial price vs. booking directly with hotels. Hotels.com is abundantly clear that those mass email discount codes override all other discount benefits. Hotels.com is definitely a rewards program worthy of investigation. I prefer to stick to the Hilton and IHG programs to get stays and points. Hotels.com does have its use though if you are staying somewhere without a chain, or where the chain Hotel is too expensive. I will need to check this out! Definitely going to take advantage of this! This is good information, but I think I will still get the most of what we are looking for by staying with our Hilton and IHG rewards and status programs and book with the chain. We love the flexibility of the hotels.com rewards program. It is so much better that having to keep track of the awards program from multiple brands. When I post a comment, I’m supposed to see a pop-up allowing me to select an American Airlines account to receive 5 miles. I am not seeing this pop-up even though I am logged in. What am I doing wrong? If you are not seeing the popup, get in touch with the support team via the contact page. We have made good use of the hotels.com rewards program and to continue using it. The scheme is really good for corporate travellers – you get a great return on your spend, and your company will reimburse the total price shown on your hotel receipt. I have previously used the free night credit a couple of times but now I just find a 10% off voucher for each booking which seem to be available all the time with a quick Google search. I am missing out on 2% cash back in the UK (which hasn’t always tracked in the past.) Not using the vouchers also gives me greater flexibility as they cannot be redeemed at all hotels. I prefer using hotel’s own programme’s simply because they credit very quickly, meaning less time spent tracking down missed points. Thanks for the update, we usually book hotel chains directly but sometimes find ourselves booking no name hotels etc. I have just been searching more randomly to find the best price but I guess is should be trying this instead. On my last stay I booked through hotels.com, hotel clerk told me they have a partnership with Amex (but not the FHR) I’d enjoy an upgrade, hotel credit and other. It was a bummer. Is it possible to buy hotels.com gift vouchers in the UK at a discount? Hotels.com good for finding off-the-beaten-path places to stay. Often can get a discount for foregoing the free night after 10 stays promo if you don’t use them often. Lately I have found better rates on the hotels websites. I will always check first on Hotels.con to see what they are offering. There are also often Hotels.com gift card deals on eBay. From legit merchants. So you’ve got your 10% in their rewards program but you can also save 10-15% on buying the gift card you use to pay for the stays. Great breakdown of using hotels.com. I especially liked using one of the travel credit cards to get the charge reimbursed or earning additional credit card points. I have had great success with hotels.com. I have redeemed rewards for 1 free night each year. Plus they have been nice enough to price match any time I’ve found a lower price for the same type of room on any other website. If you don’t have top level elite status with a particular chain, hotels.com’s return is nearly always going to be better. In fact, with of the “enhancements” happening to hotel programs these days, I am beginning to wonder whether it might be the best strategy to just abandon any idea of status and just use hotels.com for everything. I’ll use hotels.com whenever I’m staying at an independent hotel, or a chain I stay at very rarely. Still use the hotel sites for all the major programs. I use hotels all the time in Asia, especially when the international brands are 3-4x the cost compared to local hotels. A lot of these offers don’t work in the UK, but this one works well – I stack Topcashback (3%) and my cashback credit card (1%) with this (10%). Always worth cpmaring the price via Trivago and claiming on the price guarantee if there is any difference, but I don’t find this very often. I like hotels.com because of the flexibility to book various brands and types of properties, and the rewards system is very straightforward. Great tip on BeFrugal. Does CSR ever offer bonus rewards through their merchant partners for hotels.com? If so, that’d be a sweet deal. Not to our knowledge—at least not on a consistent basis. I use hotels.com all the time and I have benefited from the free nights. What has been really great is that I attend a conference at the same hotel each year and hotels.com always has at some stage a discount offer (as much as 30%) that includes this hotel, at which time I am able to book a Club Room for less than I can ever book a Standard Room, and always at a better price than I can get direct with the hotel. I used Hotels.com to book 3 weeks of hotels for 4 people thinking we could save money with the free night. Because I used the promo code they emailed me during my booking, my nights were not eligible. The promo code saved us less than $7 USD but cost us several nights in point. Why would any company send to their consumer promo code to use and turns around to penalize the person for using the promo code? There are better rewards programs.